River Welland ace Mick Parkinson fishes one of his Spalding club’s venues to prove that the famous river is bouncing back despite the rising popularity of commercial carp lakes. Find the colour in the water and fish Mick’s way and double-figure bags are on the cards. I LOVE fishing the Welland. It’s a challenge for sure, and sometimes it can be really hard. But for me it’s real fishing, and when I catch a nice bag of silver fish from the river I know that I’ve done well. I admit I am biased, but I have to be honest and say that I would much rather have a double-figure net from the Welland than 100lb from a commercial fishery. Most of you will have heard of the Welland even if you’ve never fished it. It was once a match Mecca, a place where legends like Ivan Marks and Roy Marlow carved out their reputations in matches where they would beat sometimes 1,000 anglers. That was way back when in the 1960s and 1970s, when the river held a fine head of skimmers. Sadly, featureless Fenland rivers like the Welland experienced a massive downturn in sport through the 1980s and 1990s. The water became clear and the fishing tailed off as a result. They are not massive but anglers are delighted to see small skimmers and hybrids back on the Wide Welland. 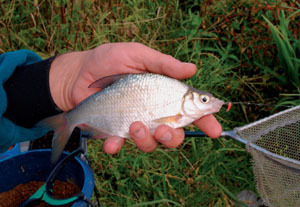 Anglers who pre-baited or fished at night could get good catches of big bream to 8lb, but as a match venue it was nowhere and for years hardly any matches were held. Even the recently revived Welland Championship is just a shadow of its former self, attracting under 50 anglers when once it was in the top-10 matches in the calendar. Why then, would I be here today… trying to encourage anglers back? Well, I’ll let you into a secret. The Welland is back. The skimmers and hybrids are back. The roach are back. Some of us have been enjoying brilliant sport and, with some careful planning and some more backing from the region’s anglers, the venue may even be capable of holding major competitive events again… soon. Some of you will be thinking that I am talking about the town centre in Spalding, an area that has gained an excellent reputation as a winter hotspot over the last three years. I certainly would not put you off fishing in this area. It’s a place where the silver fish congregate in large numbers, drawn by the warmer water created through its town-centre shelter and the fact that cormorants won’t venture into highly populated areas, so the fish feel safe. But the truth, and the real secret, is that the Wide Welland is bouncing back too, with more skimmers, hybrids and roach to be had than for 20 years. The trick on the Wide Welland at the moment is to be in the know as to where the big bream shoals are. This isn’t as difficult as it sounds, because we are talking about huge shoals of fish which colour up the otherwise clear water. Find the coloured water and you have found the bream. Find the bream and you have found the skimmers and hybrids. 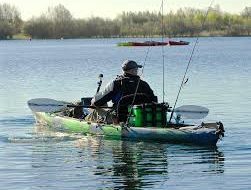 Those anglers who fish the venue as often as I do have come to know that the bream can be in certain spots for a few weeks and then just disappear, leaving only a handful of resident perch behind. So, to be honest, fishing can be a bit patchy. However, once you find the shoals then sport can be wonderfully enjoyable. Today I am fishing just up from Spalding, near the A16 road bridge. Bridges do seem to attract fish shoals, probably because cormorants don’t like them. And if you are new to the river and don’t get a chance to make a call to the local tackle shops, a bridge swim is as good an area to start as any. Dead maggots are important as they can be fed through the groundbait without breaking up the balls in flight. Mick also likes to fees a few dead pinkies in the groundbait balls. He feeds ‘a sausage’ of groundbait like this every two or three fish. The mix has to be dark. If you thread the first maggot up the shank and hook the second upside down, you connect with more bites. Double-caster, triple-pinkie and double-dead maggot are all effective change hook baits. 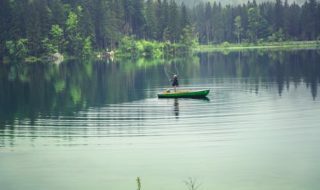 Assuming that you believe me that the venue is now worth fishing, what I’d really like to talk about and explain in this article is the rather unique method we are using on the venue. The Welland is not a very deep river, usually between eight and 10 feet, but it is quite open and exposed to the elements, lying as it does in an area of flat terrain. 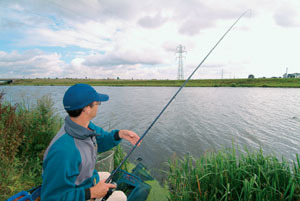 A long rod is key to this technique as it allows the angler to pick up line quickly and connect with more bites. The pylons are much further away from Mick than they look to be in this picture. After years of experience here, most of us fishing the river have come to the conclusion that the best approach, if you want a bag of fish, is not the feeder or pole… but the long waggler. The feeder will work of course, and it is a good method for big bream when you know you are on them. 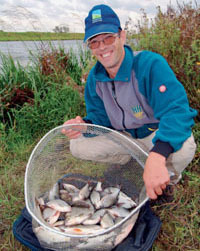 But the interesting thing is that you catch only the bream on the feeder, and not the skimmers and hybrids. You can pole fish but the silhouette of the pole often scares fish in the clear water and because of this they usually sit well beyond pole range. So if you are looking for bites, rather than a 100lb-or-bust approach, you need to fish the float beyond pole range and therefore you need to waggler fish. The waggler allows you to trundle bait close to the bottom, and that’s how these silver fish want it. Let’s start with the tackle required and then move on to feeding. 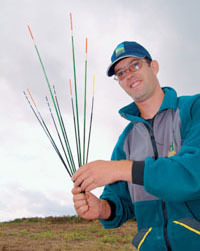 I favour a long rod for this waggler work with the MAP Concept Match being the tool of choice. A long rod helps when fishing a fixed waggler in the deepish water and allows me to pick up line quickly and connect with the fast bites you can get from the skimmers, hybrids and roach hanging around close to the big bream but just off the bottom. 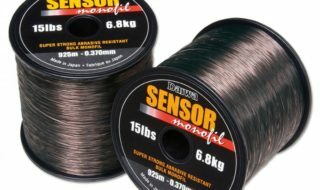 I tend to use the 18ft combination on the Concept Match and my reel line is 21/2lb Maxima with a Shimano Antares 0.10mm hooklength. Now onto the special extra-long wagglers needed on this water. You can see just how long in the picture overleaf. Finding peacock quill that is very straight up to 2ft long is not easy and most of my own home-made floats tend to tail off at around 15 inches. In fairness, floats of that length are perfectly usable on the Welland. However, I have found a source of extra-long wagglers, superbly well made by Drake Floats, and I really do like to use these. These are available from Benwick Sports, although I am not promising he’s not sold out if you call. Well, the answer is simply to beat the wind and surface tow. A long float attached at the bottom end only, as the wagglers are, will take the line well below the surface, two feet below in the case of Drake floats. That means the line is well below the surface skim and that the float can sit in the water and move downstream naturally. This is ultimately going to gain you much better bait presentation and that in turn will equal more fish in the net. The use of a long float combined with a bulk in the form of an olivette down the line will allow the hook bait to go through the swim in a very stable way and that is what the fish want. The rest of the shotting is very positive as well, with a group of No8s just above the 12in hooklength, and generally I will fish with this tripping the bottom by perhaps six to 12 inches. The float will beat the feeder, in my view, when shy-biting roach and skimmers are the main target in all but the most severe conditions, simply because bite registration is more direct than on a quiver tip. The hybrids have very soft mouths and you need to play them carefully to land every fish. They like a moving bait which is why feeder anglers rarely catch them. In the warmer months there are lots of bleak in the upper layers of water on the Welland. That’s why it’s important to feed a sticky groundbait mix to get the bait down and also to fish with an olivette down, to get the hook bait through the bleak shoals quickly. When you’re fishing double baits you should always use a swivel to attach the hooklength to guard against line spin. Another way of reducing line spin is to hook the first maggot the normal way and the second in the point, effectively upside down. Mick fixes the float to the reel line with an interchangeable float adaptor incorporating a clip swivel. If he needs to step up to a heavy float, then he can do so easily. The swivel also helps the float to ‘fold’ on the strike, which helps to set the hook more directly into the fish’s mouth. Okay, I think the best way to explain this style more fully is to put it into practice, so I’ll describe today’s session and hopefully the method and the thinking behind it will all become clear. Although the Welland is mostly gin clear, you need to use groundbait generously to make this method work. However, because of the clarity it’s important to use a dark mix. Silver fish do not want to be exposed over a light area of groundbait in case of predation in the clear water. I use Sensas Bremes 3000, Sensas Lake Black, Sensas Farine (sweet biscuit flour) and I also add liquid molasses to my water before mixing the dry ingredients. This is a blend that I have found to be hugely effective on the Welland. Its sweet essences are what skimmers, roach and hybrids seem to find very appealing. I usually feed a line just shy of mid-river. At the start of a match or pleasure session I will introduce four to six balls of firmly squeezed mix to that line because I want the feed to go directly to the bottom. The groundbait is laced with casters and hempseed plus dead red pinkies and dead red maggots. I scald the maggots to kill them so they will not bury their way into the bottom, and experience has taught me that the fish don’t really care if the maggots are alive or dead. I will use the dead maggots on the hook from time to time too. I shot the float around the base but, as I explained, also use the olivette down the line. I find that using an olivette prevents tangles, which might otherwise occur with groups of shot. It is much neater. Clearly, the one disadvantage is that you can spread out shots, but you can only move an olivette up and down the line. Personally, I find this to be no hindrance really, as the whole point is to keep the fish near the bottom and not try and catch them on the drop. The floats I use have a variety of coloured tips so that I can spot them more easily under different lighting conditions. Blaze red and black are the main colours, though fluorescent yellow may be preferred by some anglers or on venues where there is far-bank cover to make the water appear dark. Here on the Welland, however, it’s very open and black is the best colour of all. Most of you will have heard that you need to use a dark groundbait in clear water conditions, but do you know why? The reason is… predators! Silver fish will not sit over a light area, because their silhouettes are much too easily made out by predators from above, including cormorants. If you feed a light groundbait, like plain brown or white crumb on a clear venue, it’s the kiss of death. As well as keeping the mix dark, Mick adds molasses to his mix, which is a sweetener that skimmers and bream love. The hand-made extra-long straight peacock wagglers are so important to this technique as they allow the angler to bury the mainline much further than normal under the surface. This is vital on open waters with a lot of downstream surface skim such as the Wide Welland and on some of the drains to the east of the region. With the line not affected by the wind and the surface skim, the bait can move through the swim naturally, and the result is that you get far more, and far more positive bites from the skimmers and hybrids. The floats used by Mick in this feature came from Benwick Sports on Main St in Little Downham, Ely, Cambs. No guarantees that they still do them, but the telephone number is 01353 698936. When I am using the black tips, I like to add two or three white bands using Tipp-Ex so that lift bites, which are quite common, are clear to spot. Typically, I use a small bulk of No10 shot on the hooklength, which sits just off the bottom as the float passes down the swim. If a fish lifts the bait off the bottom, then these shot will lift and the float will rise and indicate a lift bite. I will vary the hook bait but tend to commence on double red maggot mounted on a size 16 or 18 hook. Clearly, time of year and temperature will dictate the hook size required. My preferred hook is a Mustad Wide Gape Power pattern. I tend to favour hooking the maggots by threading the first one well up the shank and hooking the second by the thin end so that I get a clean contact on the strike. I would also use double and triple pinkie, plus double caster and double dead maggot. I prefer the larger baits, to avoid the hordes of bleak in the river which can present a nuisance, especially in warmer months. They are another reason why I use an olivette set-up, just to get the bait past them in the upper layers. By using the long rod I can cast the fixed float easily and control its passage down the river. Striking is easier and more direct with a longer rod too. There are fewer missed bites because the rod picks up more line more swiftly. The rig settles quickly when using an olivette as the bulk. It’s all about getting the bait to the target fish quickly and presenting it to them right. Big bream or bust on the Wide River Welland? Mick Parkinson shows that if you do it right, that’s far from true. I will usually top up the swim with a ‘sausage’ of groundbait after every two or three fish have been caught. Really, you have to play it by ear when it comes to the regularity of feeding. Let the fish dictate. The target fish tend to be roach from 3oz to 10oz, plus plenty of hybrids from 4oz to 1lb. These hybrids fight well on light gear and it pays not to bully them too much as they have soft mouths and the hook can tear out all too easily. I prefer to net most fish above a few ounces for this reason. 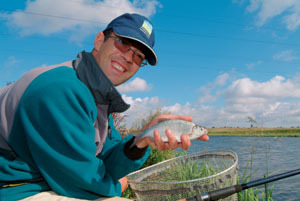 No two fishing days are ever the same, but generally speaking on the Welland sport does improve after the first half an hour, but can tail off a bit around the middle of the day and then switch back on again later in the match. With this in mind, it is therefore important to maintain some feed going into the swim even when it’s tough going, as the fish do respond again later on. In matches, and there are more and more held on the Wide Welland these days although they are more like club matches than opens, you need to have caught close to double figures to feature in the top places, and that’s not bad sport in my mind. Today, in front of the Midland Angler cameras, I have done reasonably well and had over 10lb to show for my efforts and I am pleased with that. The Welland won’t be to every angler’s taste I know, but if you fancy something of a challenge, using gear that requires a fair measure of skill, then you could find that a day on the Welland is right up your street. It is my great wish that the river continues to improve in the way it appears to be doing, and that one day the colour may return to it again and that’s when it will really fish consistently. In the meantime, us happy locals will continue to enjoy some excellent silver fish sport, but you’re welcome to come and join us of course! 1 Mick likes to paint a white band on his float tips so he can spot the regular lift bites easily. 2 The long wagglers are attached using a float adaptor, so he can change float size as conditions dictate. 3 The bulk to settle the float is an olivette – the float thus settles quickly and the bait is not intercepted by bleak. 4 Mick’s 0.10mm hooklength seems to be the ideal balance between finesse and not cracking off on the strike. 5 The extra-long Drake peacock wagglers are loaded, but still take an extra two or three grams. How to get there: The B1166 road runs along the Wide Welland and can be accessed from the A16 at Market Deeping. Parking is in lay-bys and you may have a fairly long walk to your peg. One trick for the Welland is to park up and then walk along the river until you find colour in the water. You have then found the fish.